This Brake Piston wind back set weighs nearly 2.6kgs to help sustaniate its quality and durability. Excellent professional quality. Please look at the the picture we have taken to see the quality of this set. Applications 4 : Land Rover and 4 Wheel Drive Vehicles. The Set Of Adapters Are Suitable For A Wide Range Of Vehicle Applications. This Is Suitable For Push Back And Wind Back Brake Pistons. It Includes Left And Right Handed Thrust Bolt Assemblies. 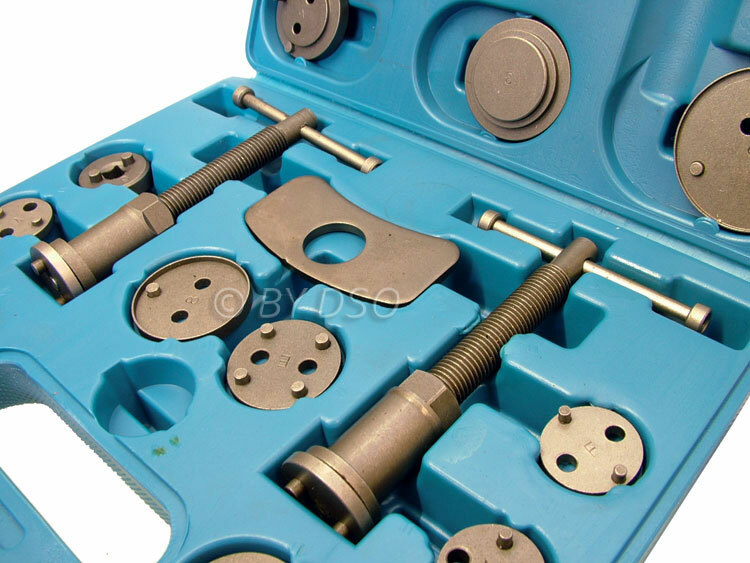 The Left Handed Thrust Bolts Are Suitable For Ford, Citroen And Renault Applications. The Precision Made Adapter Plates With Thrust Bolt Assembly and Reaction Plate, Helps Prevent Damage to Pistons and Seals. The Updated Adapter Set Is Suitable For A Wide Variety Of Vehicles.